Basically, LHCb measured all these Sn and FL coefficients as a function of q^2. The largest anomaly is observed at low q^2 in the parameter S5 (also presented as P5' which is S5 rescaled a function of FL). 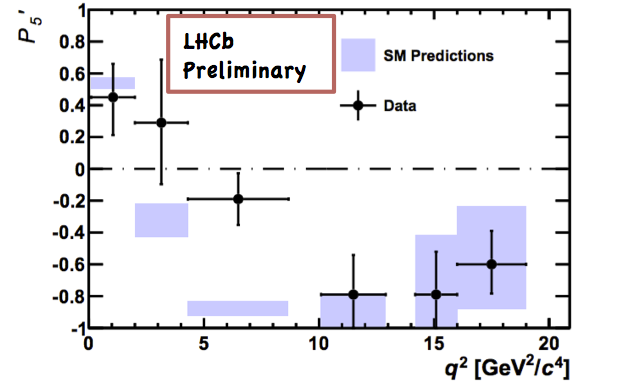 LHCb quantifies it is a 3.7 sigma deviation from the Standard Model in the region 4.3≤q^2≤8.68 GeV^2; this is downgraded to 2.5 sigma if the look-elsewhere effect is taken into account. Theorists fitting the data quote the deviation between 1 and 4.5 sigma, depending on theoretical assumptions and how the data are sliced and cooked. where Λref≈35 TeV. 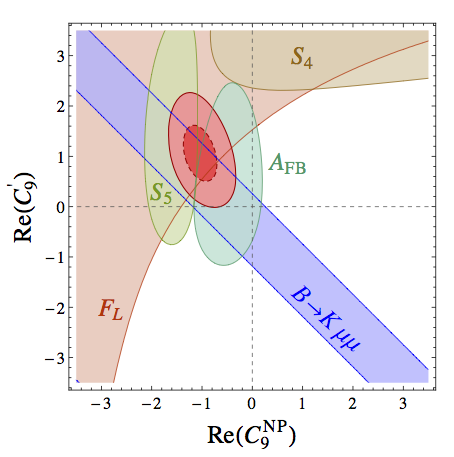 This set of operators allows one to describe the B → K*μμ decays in a completely model independent way, whether within the Standard Model or in some new physics scenario. In the Standard Model a subset of these operators is generated (see the diagrams) with the coefficients C7, C9 and C10 of order 1 (the suppression scale of the effective operators is tens of TeV due to the loop suppression, and also due to the CKM suppression via the small Vbs matrix element; this is why B → K*μμ is so sensitive to new physics). 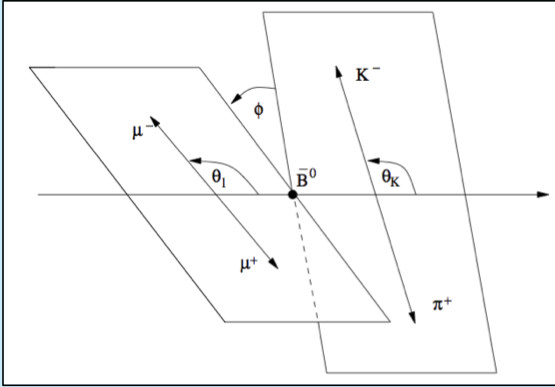 New physics could provide additional contributions to these 3 operators or produce the C' operators that are not generated in the Standard Model at all. For example, the tree-level exchange of a Z' boson coupled to leptons and, in a flavor violating way, to quarks could affect C9 and C9'; the dipole operators C7 and C7' could be generated e.g. by loop diagrams with a charged Higgs boson, and so on. Now, all of these operators affect the angular distribution of B → K*μμ decays, in particular they can shift the anomalous observable S5/P5'. But one should be careful not to screw up the other observables that remain in a good agreement with the Standard Model. Moreover, the same operators also affect countless other processes in the B-meson sector, including the well measured branching fractions for B → Xs γ and Bs→μμ decays. 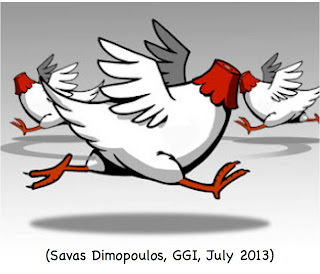 Thus, it is a non-trivial question whether a consistent solution to the anomaly can be found. The answer is that that, indeed, there do exist regions in the parameter space where the fit to the data is much better than in the Standard Model. According to this paper, the best scenario is the one where new physics generates simultaneously C9 and C9', with the contribution to C9 similar in size but opposite in sign to the Standard Model effective contribution. Other combinations of the operators can also improve the fit, but the gain is less striking. After the first run of the LHC particle physics finds itself in an unprecedented situation. During most of the history of the discipline we had a high energy scale that allowed us to organize our theoretical and experimental efforts. It first appeared back in the 1930s when Fermi wrote down his theory of weak interactions which contained a 4-fermion operator mediating the beta decay of the neutron. For dimensional reasons, 4-fermion operators appear in the Lagrangian divided by an energy scale squared, and in the case of the Fermi operator this scale is what we now know as the electroweak scale v=174 GeV. This scale come with well defined physical consequences. 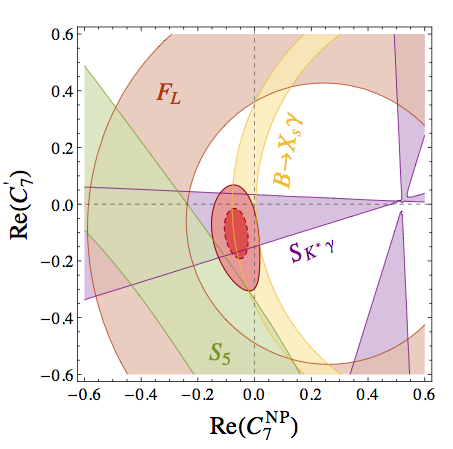 Scattering amplitudes in the Fermi theory misbehave at energies above v, and some new physics must appear to regulate them. Later several details of this picture were modified. In particular, it was found that the Fermi 4-fermion operator is a low energy effective description of the exchange of a W boson between pairs of fermions. 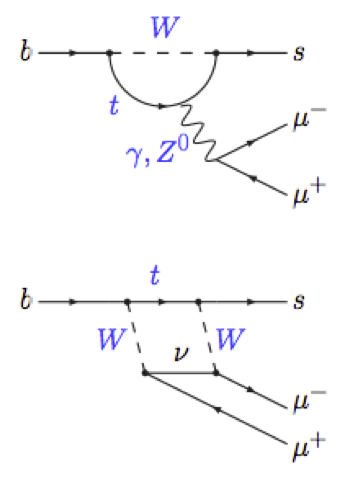 However the argument for new physics near the electroweak scale remained in place, this time to regulate the W and Z bosons scattering amplitudes. That's why even before the LHC kicked off we could give an almost risk-free promise that it was going to discover something. There's actually one important practical consequence. Regardless how high energy collider we build next: 30 TeV, 100 TeV, or 1000 TeV, we cannot be sure it will discover any new phenomena rather than just confirm the old theory in the new energy range. This is not to say that the Standard Model must be valid all the way to the Planck scale. On the contrary we have strong hints it is otherwise. The existence of dark matter, the observations of neutrino oscillations, the matter-antimatter asymmetry in the Universe, and the cosmological inflation, they all require some physics beyond the Standard Model. However none of the above points to a concrete scale where new phenomena must show up. The answers may be just behind the corner and be revealed by the run-II of the LHC. Or the answer may be due to Planck-scale physics and will never be directly explored; or else it may be due to very light and very weakly coupled degrees of freedom that should be probed by other means than colliders. For example, for dark matter particles we know theoretically motivated models with the mass ranging from sub-eV (axions) to the GUT scale (wimpzillas), and there is no mass between these two extremes that is clearly favored from the theory point of view. The case of the neutrino oscillations is a bit different because, as soon as we prove experimentally that neutrinos are Majorana particles, we will confirm the existence of a set of dimension-5 operators beyond the Standard Model, the so-called Weinberg operators of the form (H L)^2/Λ. Then the scale Λ is the maximum energy scale where new physics (singlet Majorana neutrinos or something more complicated) has to show up. This is however little consolation given the scale emerging from neutrino experiments is Λ∼10^15 GeV, obviously beyond the direct reach of accelerators in a foreseeable future. with Λ of order 30 TeV. And if not, there are hundreds other doors to knock on. Demonstrating the presence of a nearby new physics scale would surely bring back momentum to the particle physics program. At least, we would know where we stand, and how big a collider we must build to be guaranteed new physics. So yes, a kingdom and on my part I'm adding the hand of a princess too..